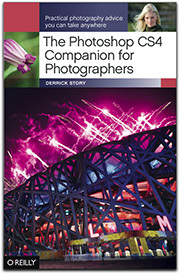 Most photos that are submitted to The Digital Story lack important metadata, such as author name and copyright. We have many good tools to help us identify our work so others know who the photographs belong to. For example, using EOS Utility, software that came with my Canon DSLR, I can add identifying metadata to the image at the point of capture. The first screen shot show me setting up the camera, and the second screenshot shows how the information is displayed in the Preview application for the Mac. Top image: shows where I enter my personal metadata in EOS Utility so it will be included in the EXIF data of every shot I capture. Bottom image: here's how it appears in Preview after upload to my computer. In this week's podcast, I talk about the value of personal metadata and cover ways that you can add it to your images. Hello Derrick, Good show. I did not realize that Photoshop stripped that information. I have had it in my workflow to add that information in Aperture. When I resized in PS CS3, I never thought of checking for that information again. Luis, Keep in mind that Photoshop only strips out copyright metadata when you use the "Save for Web" function, and only prior to CS4. The current version (CS4) fixed that problem. I wanted to change the owner and copyright status on my rebel XSi. In EOS Utility I only get the option to change the author name. Is this a limitation of the camera or am I missing something? Anyone know? Thanks! Have you downloaded the latest version of the utility? That might be the answer. Thanks for the idea. I downloaded the latest EOS Utility but I still could not enter owner and copyright info. I downloaded the EOS Utility instruction manual and learned that these fields are only available for the 50D and 5D MkII. I have a Nikon D80 and have been searching for this feature which would allow me to enter EXIF information (Name, Copyright, etc.). So far, the only option I've found is a field labeled "Comments" through the Setup Menu on the camera in which you can enter up to 36 characters. 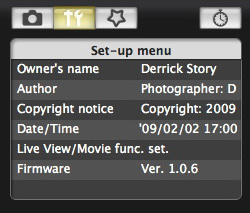 I entered my name and the year, transferred it to aperture, iPhoto and Bridge yet I could not see this info in any of these products in the IPTC or EXIF metadata panels. I also looked in the Nikon software manuals that came with the cameras (Nikon View, Picture Project) and could not find this either. Any idea what's going on here? I appreciated these comments and have tried to add this data to my Canon 40D. As mentioned above, author and copyright are not available to users of this model camera, I have just downloaded the latest EOS utility (2.5) and firmware (1.1.1) for my system. These useful field are just not available. Does owner's name transfer as part of the meta data?